CloudWay as an Microsoft EMS Elite Partner is proud to announce that our COO and Enterprise Mobility MVP Jan Ketil Skanke is speaking at Microsoft Inspire in Las Vegas this July. Jan Ketil is co-presenting with Mayunk Jain, a Senior Product Marketing Manager at Microsoft. 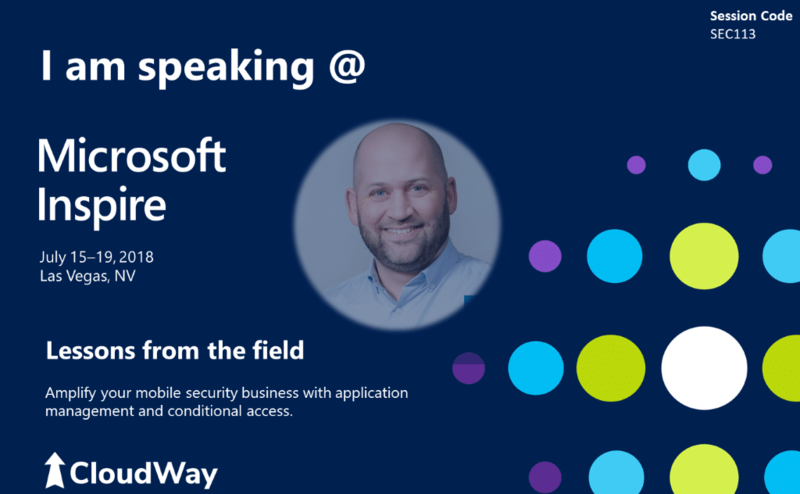 Jan Ketil will showcase real-world customer challenges and how functionality like Mobile Application Management and Conditional Access serve the customer’s security needs in a unique way. He will also share tips and lessons learnt to make your own deployment successful. Review real-world customer scenario and how Microsoft 365 and EMS uniquely serve the customer’s security needs. You’ll hear from an Intune partner and Microsoft MVP, who will share lessons learnt and tips to make your own deployment successful.